An interesting take on the First Contact story. This one takes place in the Middle Ages, as an alien ship crash lands in the Black Forest of Germany near the small village of Oberhochwald. Tied in to this tale of the past is one that takes place in the present as two researchers (and lovers) try to solve the mystery of the disappearance of the village of Eifelheim (once called Oberhochwald) from recorded history and the implications this may have on their separate fields of study. I found the tale in the past to be the more compelling of the two, though they do work well together as a whole. Flynn does an excellent job of bringing to life a realistic Middle Ages that doesn't look sneeringly down on the "superstitious savages" of that age. All of the characters we meet in Oberhochwald are fully developed people, none of whom are simply "good" or "bad". In many ways it is actually they, and not the extra terrestrials, who are the real aliens to the modern reader as we struggle to comprehend the worldview that they take for granted. Despite this I found them all to be ultimately sympathetic, human characters. We primarily follow the story of Father Dietrich, the intelligent and sympathetic pastor of the Oberhochwald church as he first investigates, and then befriends the benighted starfarers, but all of the other people from his village whom we see cover tha gamut of human experience and become more than just placeholders for "character type X". The Krenk, the insect-like aliens from another world, are by turns humorous and frightening in their interactions with the humans of the small village and Flynn again does an excellent job of making even these non-human pseudo-hivemind creatures into fully fleshed-out "people" (without falling into the trap of making his aliens simply humans in rubber suits). As the story in the past builds up from a mystery into a full-blown tragedy that both we and the characters of the story see as the almost inevitable outcome of the circumstances in which they find themselves, we can do little but watch in fascinated horror. 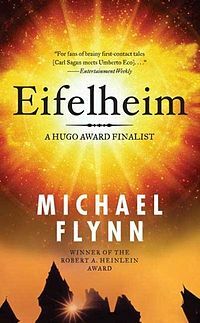 Despite this tragedy Flynn does not leave us without hope: we see in the heroic actions of the characters of this tale (both human and alien) an acknowledgment that goodness can cross all boundaries and we are given examples of selflessness and love that are truly inspiring. Next to this tragedy of life, love and death it perhaps isn't surprising that the story of two modern researchers grappling with the intellectual enigma of a lost medieval village and the secrets it may hold pales somewhat in comparison. The modern portions of the story still do hold some interest and are ultimately able to bring the tale full circle to a point of completion that is elegant in its resolution.